Michael Ruel understands the paramount goal of his clients is to obtain the most favorable resolution of their case quickly while minimizing the costs associated with protracted litigation. To that end, Michael believes it is important to work as a partner with his clients by keeping them timely informed of the developments in their case so that they maintain control of the litigation to achieve the desired outcome. Throughout his career, Michael has employed proactive and tactically aggressive approaches to promote the interests of his clients to obtain those goals. Having tried numerous jury and bench trials in federal and state courts, as well as arbitrations, Michael has developed the skills to effectively represent his clients while at the same time recognizing when a matter should be resolved to minimize the inherent risks with litigation. Before embarking on a legal career, Michael served in the U.S. Air Force as a member of the 55th Special Operations Squadron at Hurlburt Field, Florida. In addition, Michael has extensive prior work experience in the retail sales, automotive, and banking industries giving him the real world knowledge and understanding of business operations, human resources, and cost management. Michael’s vast experience has carried over to his legal practice resulting in favorable outcomes for his clients in high exposure cases. Michael handles claims throughout Florida and his practice consists of general casualty litigation for primary and excess carriers, including claims for construction defect and liens, wrongful death, personal injury, premises liability, admiralty and maritime, products liability, environmental torts, contracts and first party insurance disputes, as well as insurance coverage and bad faith claims. 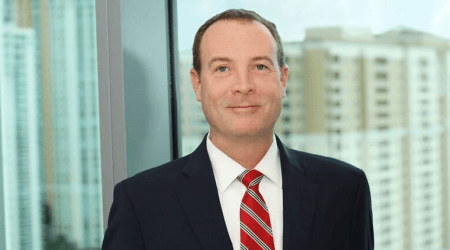 A significant portion of his first-party practice involves representing the three largest property insurance carriers in Florida in matters involving commercial property claims by businesses, apartments, condominiums and home owner’s associations. Michael’s representative clients include insurers, architects, engineers, general contractors, subcontractors, marinas and other maritime interests, private businesses and building owners/tenants. Michael’s experience and success have earned him an “AV” rating from Martindale-Hubbell, the directory’s highest rating for attorneys. He is also frequently invited to speak at seminars relating to his practice areas.